The city of Melbourne provides business, leisure, international and relocation travellers with a wide variety of different accommodation options. There is a variety of hotels, motels, serviced apartments and B&Bs to choose from in Melbourne, which makes finding the ideal place to stay a daunting and time consuming task. This is where an expert like OzHotels comes into play. Here you will be able to compare hundreds of different properties situated in the Melbourne city centre and all around the Melbourne suburbs, in order to find the one that fits in with your travel budget and meets all of your needs. The recently renovated Kingsgate hotel offers travellers the choice of very affordable double, twin and family hotel accommodation in the heart of the Melbourne CBD. The Kingsgate Hotel is conveniently located on King Street in the city centre, which places it close to the Crown Casino Entertainment Complex, the restaurants in the Southbank precinct, Etihad Stadium, the Aquarium, Rialto Tower, the Eureka Sky Deck, Southern Cross Railway Station, the beautiful Yarra River, Queen Victoria Market and the Bourke Street Mall. For something special whilst you are staying at the Kingsgate Hotel Melbourne why not take the short 2 minute walk to the abundance of shops and restaurants that are located in the nearby Docklands precinct and Harbour Town shopping complex. Darling Towers is the leading supplier of serviced apartments accommodation in Melbourne and are perfectly located with the corporate world in mind. With over 250 self contained studio, 1, 2 and 3 bedroom apartments, townhouses and residences Darling Towers is ideal for short stays as well as having cheap rates for extended stays. Darling Towers has affordable apartment accommodation in the Melbourne CBD close to numerous restaurants, shops and cafes in the Southbank precinct, Flinders Street railway station, the Bourke Street Mall, Crown Casino and the Yarra River. For holiday or business you can stay at the Darling Towers Apartment in South Yarra or St Kilda, which are close to shops, restaurants, cafes and public transport. The BreakFree on Collins Melbourne Serviced Apartments offer outstanding value whether you are staying in Melbourne for a few days or on a long-term basis. All studios, 1 & 2 bedroom apartments are fully furnished and self contained, featuring state-of-the-art finishes including marble and granite benches, parquetry floors and FREE Foxtel TV including Fox Sport, Fox Sport 2, CNN International, National Geographic and Nickelodeon (Kids TV). All apartments are modern, spacious, comfortable and non smoking, further offering air conditioning and heating, comfortable bedding, alarm clock, radio, private ensuite bathroom/s with bath, shower, toilet, hair dryer and FREE bathroom amenities, seperate living room with sofa/ lounge suite, DVD player, WIFI ( fee applies), direct dial phone, a fully equipped kitchen with high quality Bosch stainless steel appliances including a microwave, full size fridge, full size stove, dishwasher and full cooking facilities/crockery/cutlery/kitchen utensils, dining table and chairs, tea/coffee making facilities, full private laundry facilities with washing machine, clothes dryer, ironing facilities. 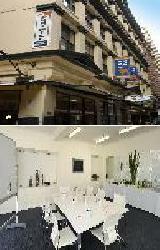 Situated in the middle of the city centre the Victoria Hotel is one of the best value for money Melbourne hotels available. With a range of standard and heritage queen, twin and family rooms available, complete with all of the amenities to make you feel right at home, the Victoria Hotel provides something for every type of traveller. This historic Melbourne accommodation is ideally positioned within easy walking distance to the Bourke St Mall, Town Hall, Chinatown, Federation Square, Arts Centre and the numerous restaurants and shops in the Southbank precinct. Guest who stay at Victoria Hotel can make full use of the indoor heated swimming pool, sauna, spa pool, gymnasium and business centre. 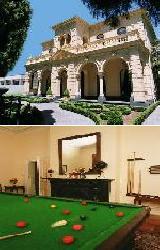 There is also a delightful restaurant and bar where you relax with a drink and a meal at the Victoria Hotel. 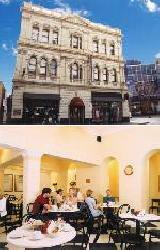 This and many other features makes the Victoria Hotel the best value Accommodation in the Melbourne CBD. The Melbourne city accommodation provided by the Oaks Apartments is perfect for all types of travellers including singles, couples, families and groups. 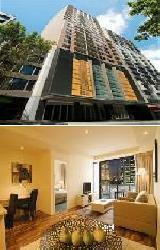 There are 4 different Oaks properties located around the Melbourne CBD, all of which provide business and leisure travellers with a choice of luxury studio, one, two and three bedroom serviced apartments close to city centre attractions like the Melbourne Aquarium, Exhibition Centre, Crown Casino, Federation Square, Queen Victoria Market, Etihad Stadium, restaurant and shopping precincts. As an affordable alternative to staying in the city centre you may wich to stay in cosmopolitan South Yarra at the Oaks Pinnacle. With something for everyone the Oaks Apartments have been designed to make your stay in Melbourne memorable and affordable with cheaper rates for long term stays. 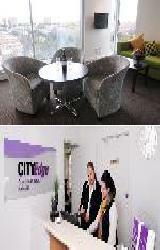 City Edge Serviced Apartments are the perfect Melbourne accommodation for both corporate travellers and leisure guests alike. 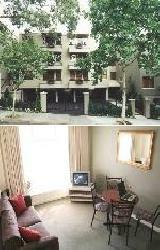 These serviced apartments are conveniently located in numerous locations including the quiet suburb if East Melbourne which is arguably the most beautiful and tourist friendly part of Melbourne, the Melbourne CBD surrounding by all of the city's main attractions and North Melbourne where guests can experience the same level of quality service that city edge is known for. All of the City Edge Serviced Apartments are close to all of Melbourne's major tourist attractions including the MCG, Melbourne Park Tennis Centre, Southbank, CBD and shops, restaurants and public transport. The Flagstaff Motel is a very affordable hotel accommodation that is superbly located in the Melbourne CBD, just a short walk away from the Etihad Stadium. The Flagstaff City Inn provides the perfect location for both the tourist and business client alike, because the accommodation in this motel places you within easy walking distance of the Melbourne City Centre, Queen Victoria Market and public transport, as well as being in very close proximity to all the wonderful tourist attractions that Melbourne has to offer. The hotel offers accommodation for in a range of different rooms types including double, twin and family rooms, as well as 1 and 2 bedroom suites and apartments. 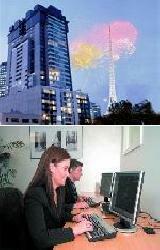 Click here for a list of all Melbourne CBD Accommodation. The Apartments Melbourne Domain in South Melbourne provides travellers with a range of luxuriously apointed 1 & 2 bedroom self contained serviced apartments that are ideally located in Albert Road, South Melbourne. Ideal for business and leisure travellers alike, the Apartments Melbourne Domain South Melbourne are set among the leafy splendour of the Domain precinct, Melbourne's most tightly held inner urban enclave. 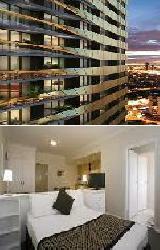 The Apartments Melbourne Domain Sth Melbourne provides all types of travellers with discount accommodation in South Melbourne. 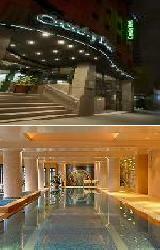 It also features a wide range of modern amenities and services such as direct internet access, lift and security access. 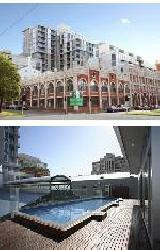 The Apartments Melbourne Domain South Melbourne places you at the heart of everything you enjoy most about Melbourne. The Mantra St Kilda Apartments provides both business and leisure travellers with the choice of modern, self contained studio & 1 bedroom apartments that are ideally located right in the heart of corporate Melbourne on St Kilda Road. The Mantra St Kilda Apartments are also only minutes to the city centre, Southbank, Albert Park and the famous shopping precinct of Chapel Street in South Yarra. This St Kilda Road accommodation features many facilities and services including internet access, faxing facilities, guest laundry, gym, lift, room service, secretarial services, 24 hour reception, baby cots and daily housekeeping. Melbourne's tram network is right on the Mantra St Kilda's doorstep providing easy access to the city and the surrounding inner suburbs of Melbourne. The Plum Serviced Apartments provide corporate business travellers, families and holiday makers with a wide range of self contained serviced apartments that are conveniently located in numerous locations around Melbourne including Southbank, North Melbourne, Carlton and the Melbourne CBD. All of the Plum Serviced Apartments are close to the city's major tourist attractions including the MCG, Etihad Stadium, Crown Casino, shops, restaurants and public transport. Punt Hill Apartments provides quality corporate and leisure accommodation in numerous city and suburban locations all over Melbourne. In the heart of the Melbourne CBD there are 3 uniquely different properties that provide self contained accommodation close to restaurants, cafes, boutiques, department stores and Melbourne's funky laneways. Located on the fringe of the city are 2 apartment complexes in South Yarra close to Chapel Street and Toorak Road with it's myriad of sidewalk cafes, restaurants, shopping and bars. Then there is a number of other apartments located in strtegic Melbourne suburbs including Essendon, Willamstown, Burwood, Knox, Oakleigh and Dandenong. The Ciloms Hotel Melbourne Airport is a popular motel accommodation for both business and holiday travellers because it is ideally located just 2 minutes from the domestic and international terminals of the Melbourne Airport. The Ciloms Airport Lodge is the Melbourne airport hotel motel with exceptionally affordable rates available for individuals, couples and groups in various room types including 2 Room Suites, Queen, Twin and Family rooms. The hotel is conveniently located only two minutes drive from the Airport in Melbourne and offers all the comforts and conveniences you would expect from a quality property and much more. Accommodation at the Ciloms Airport Hotel also includes FREE coutesy bus transfers to and from the Melbourne Airport terminals. The Bayview Eden Melbourne is a luxury Melbourne hotel that is perfectly situated opposite to the beautiful Albert Park Lake & golf Course. It is close to all Melbourne has to offer, making it perfect for business and pleasure stays with a range of Queen and Twin Hotel rooms as well as King and 2 Bedroom Suites. The Bayview Eden Melbourne Hotel is situated at the city end of Queens Road, close to major arterials and just a short tram ride from the Melbourne City Centre, St Kilda Esplanade, cosmopolitan Chapel Street and the famous Southbank precincts. The Bayview Eden Melbourne features a wide range of modern amenities and services such as currency exchange services, free car parking, guest laundry, gym & fitness equipment, lift, massage, restaurant, room service, sauna, spa, indoor pool, 24 hour reception and daily housekeeping. The Bayview Eden Melbourne Hotel caters for corporate business guests with wireless internet access in all rooms, suites and public areas, a business centre, faxing facilities, photocopying services and conference facilities. The Bayview On The Park is ideal for business or leisure because it is a luxury hotel accommodation that is ideally situated on the fringe of Melbourne's city precinct, adjacent to Albert Park Lake and golf course. 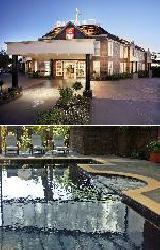 The Bayview On The Park in Albert Park has a variety of Single, Double and Twin Hotel rooms, as well as having a numerous guests facilities and services including lounge bar, disabled facilities, guest laundry, gym & fitness equipment, lift, restaurant, room service, outdoor swimming pool, tour desk, 24 hour reception and daily housekeeping. The Bayview On The Park Melbourne Hotel caters for corporate business guests with wireless internet access in all rooms and suites, a business centre, secretarial services, faxing facilities, photocopying services and conference facilities. 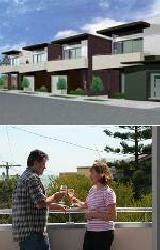 At Bayview On The Park you will be welcomed with warm smiles, friendly and efficient service. 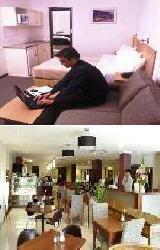 The Mantra Group is well known around Australia for its quality hotels, apartments and holiday resorts. Mantra pride themselves on providing stylishly appointed, well maintained and affordable Melbourne accommodation that is suitable for holiday makers, families, corporate relocations and business travellers. The Mantra Group has a number of properties located in the heart of the Melbourne CBD, as well as a number of other self contained accommodation properties stategically placed in popular areas like Southbank, East Melbourne and the Melbourne Airport. The luxury apartment accommodation at the Batman's Hill on Collins provides both leisure and corporate business travellers with the ideal location in the heart of the Melbourne CBD. Situated within easy walking distance of the Telstra Dome, Melbourne Aquarium, Crown Casino, Melbourne Exhibition and Convention Centre and the cosmopolitan restaurants and shops in the Docklands and Southbank precincts. Adding to the appeal of the studio, 1 and 2 bedroom apartments at the Batmans Hill on Collins is the great hotel facilities and the convenience of public transport on your dorrstep which can take you to everything that Melbourne has to offer. The Arrow on Swanston is centrally located in cosmopolitan Carlton, only a short distance from the shops, restaurants and cafes of Lygon Street as well as the Melbourne CBD. This perfect location combined with the comfortable serviced apartment accommodation is what makes the Arrow on Swanston such a great place to stay. The Arrow on Swanston in Carlton is close to everything that the city has to offer, as well as having a numerous guests facilities including a conference centre, disabled facilities, guest laundry, fitness equipment, lift, restaurant, sauna, outdoor swimming pool, baby cots and security access. With many bars, fine dining venues, tourist attractions, sporting venues and theatres within walking distance the studio, 1 and 2 bedroom apartments at the Arrow on Swanston are perfect for your next short and long term stay in Melbourne. The Quest Apartments are renown for providing corporate business guests and travellers on holidays affordable self contained accommodation that meets all your needs. There are a range of different Quest properties all around Melbourne including in the CBD, inner city suburbs and also outer Melbourne regions. One of the best things about staying in a Quest property is that you can enjoy the comfort and independence of staying in an apartment that is larger than the rooms of other Melbourne hotels. 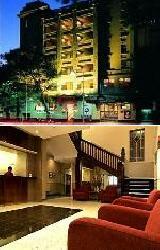 This Melbourne hotel / motel offers three and half star luxury accommodation in St Kilda, Melbourne. The Crest on Barkly is conveniently located right behind the No. 1 St Kilda Road Melbourne and provides double and family hotel rooms as well as 1, 2 and 3 bedroom apartments close to the city centre, Southbank, Crown Casino, Arts Centre, Luna Park, Toorak Rd, Chapel Street and the famous restaurant strip of Fitzroy Street. The Grand Prix circuit, Albert Park Lake and Golf Course are all at your doorstep when you choose to stay at the Crest on Barkly Hotel. 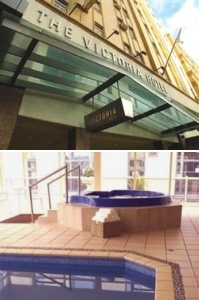 Accommodation in this delightful Melbourne Hotel comprises sauna, cocktail bar, undercover parking, off street coach parking, a-la-carte dining room, function and conference rooms. The Crest on Barkly has spacious and luxuriously appointed hotel rooms are equipped with all the facilities required to ensure a very pleasant stay. Tribeca Serviced Apartments provides travellers to Melbourne with luxurious apartment accommodation in a quiet East Melbourne city location. These one and two bedroom apartments are spacious, fully self-contained and only a short walk from the Melbourne CBD, Melbourne Park tennis centre, MCG, St Vincent's hospital and public transport which will take you to Etihad Stadium, Chinatown, Southbank and Crown Casino. 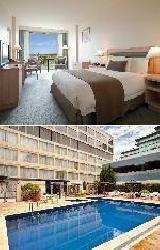 Click here for a list of all Southbank Accommodation. 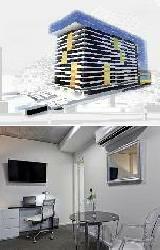 For quality Melbourne accommodation in a fantastic, central location stay at the brand new Tribeca Serviced Apartments. Easystay apartments and hotels in St Kilda Melbourne is dedicated to ensuring that your next break or holiday in Melbourne is comfortable and affordable. Easystay Serviced Apartments has in a number a locations in the bayside area of St Kilda, which are ideally located just 10 minutes to the Melbourne city centre. 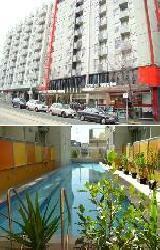 These cheap apartments and Bayside Motel are also in the heart of all the action that St Kilda's Fitzroy St has to offer. Easystay's cut price approach to accommodation in St Kilda puts more dollars in your pocket so you can enjoy more on your Melbourne holiday. 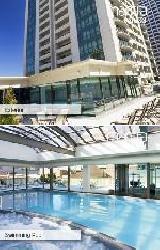 Click here for a list of other St Kilda Accommodation. The Hotel Claremont South Yarra is a tastefully restored 1886 Victorian Guest House, offering discount Melbourne accommodation for the budget conscious traveller. Our hotel is located in the heart of South Yarra, Melbourne's style and fashion capital, and is only 100 metres from the famous Chapel Street. The Hotel Claremont is surrounded by cafes, restaurants, shops, cinemas, galleries, antiques, pubs and night clubs, all of which are within easy walking distance. The South Yarra train station and Melbourne's world famous trams are also right on our doorstep. This provides you with easy access to the Melbourne CBD, Melbourne Tennis Centre, MCG, Crown Casino and Southbank precinct. Hotel Claremont's range of guest house style double rooms, self contained 1 bedroom apartments, fabulous location and affordable prices makes it the perfect for those people looking for budget Melbourne accommodation. 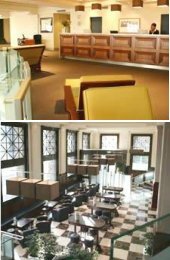 The Crossley Hotel offers Queen and King hotel accommodation as well as 1 & 2 bedroom self contained serviced apartments centrally located in the heart of the Melbourne CBD. The Crossley Hotel & Apartments Melbourne is a boutique inner-city hotel that is perfectly situated in the cosmopolitan end of the city centre at the entrance to Chinatown. This means that it is surrounded by the classic theatres, eclectic bars, renowned restaurants and major shopping outlets of the city. 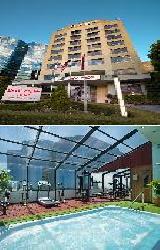 The Crossley Hotel provides all types of travellers with a wide range of modern amenities and services such as lounge bar, currency exchange services, guest laundry, gym & fitness equipment, lift, massage, restaurant, room service, sauna, spa, tour desk, 24 hour reception and daily housekeeping. The Crossley Hotel also has WI-FI internet connection in all hotel rooms and apartments, as well as a business centre, computer printing and faxing facilities. The luxury 2 bedroom self contained serviced apartments at the Beachside Apartments Bonbeach are ideally located right on the beach at Bonbeach in Melbourne's south east. Guests can enjoy fully furnished, self-contained and serviced luxury beachside apartments accommodation with the latest technology including free WiFi internet access and Meile appliances. The Beachside Apartments Bonbeach in Bonbeach is close to everything that the city has to offer, as well as having a numerous guests facilities and services including direct internet access and guest laundry. Perfect for holidays or extended stays The Beachside Apartments Bonbeach gives you more than accommodation, it gives you a lifestyle. 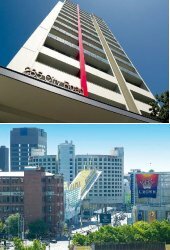 The Clarion Hotel on Canterbury offers luxury Double and Twin suite accommodation as well as well appointed 1 and 2 bedroom apartments in Melbourne's East. The rooms have been beautifully appointed in a style that will meet the needs of the most discerning of executives. 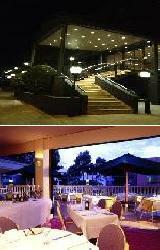 They also provide the perfect romantic escape for you and that someone special in your life. Accommodation in this luxury Melbourne hotel comprises spacious and luxuriously appointed hotel suites, with all of the facilities that you would expect from a Winner of the Flag Choice Excellence Awards for the Best 4 ½ to 5 Star Property in Victoria and Australia. The Canterbury Hotel is conveniently located in Melbourne's East, only 20 minutes from the Melbourne CBD but at the gateway to the Yarra Valley and Dandenong Ranges. 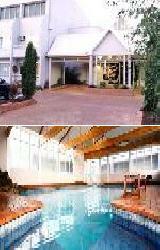 Click here for a list of all Dandenong Accommodation. The Charsfield hotel Melbourne is arguably one of the most beautiful accommodation hotel and grand Victorian buildings in Melbourne CBD. This Melbourne hotel has been classified by the National Trust and boasts 44 luxury rooms, 2 conference rooms and lavish public areas. The Charsfield Hotel is perfectly located in the heart of the St Kilda Road business district of Melbourne and has on offer a wide range of Double and Twin hotel rooms of various standards, as well as fully self contained 2 bedroom apartments for longer stays or families. Melbourne is such a large city that there are many different types of accommodation in lots of locations right across the city. Some people may be looking for Melbourne city accommodation that will have them close to everything that the CBD has to offer. Accommodation like the Alto Hotel Melbourne or the Rendezvous Grand Hotel Melbourne are ideally placed to major businesses in the city as well as public transport, bargain shopping, theatres, hospitals, restaurants, cafes, sporting venues and many other tourist attractions. Other travellers may prefer to stay in some of the inner city suburbs of Melbourne because these areas provide a much more village style feeling. Some of the East Melbourne accommodation that are available will allow you to stay away from the hustle and bustle, but still within each reach of the city. If you are a budget conscious traveller then you will possibly want to take advantage of the cheaper rates that are provided by places like the Armadale Serviced Apartments in Prahran, the clean & comfortable City East Motel in Collingwood or the Quality Inn Toorak Manor in the heart of cosmopolitan South Yarra. 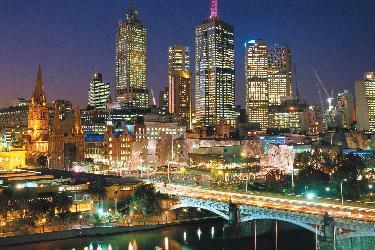 There are many other suburban locations where you can stay in Melbourne and still have easy access to the city centre. 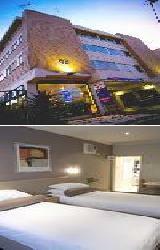 Another location that is popular with people looking for hotels in Melbourne is Airport hotel accommodation. Staying near the airport has it's advantages and you can still make it into the city centre via the Freeway in around 20 minutes. There are a number of places in Tullamarine such as the Quality Hotel Melbourne Airport, which gives travellers a place to stay when they arrive on a late night flight from overseas or allows them to easily catch an early morning flight.